White Sox 1B Jose Abreu wears a Boston Strong shirt while warming up for a game against the Red Sox on Tuesday in Chicago, one year after the Boston Marathon bombings. The Chicago White Sox have paid tribute to victims of the Boston Marathon bombing before their game against the Red Sox. The White Sox played a video montage and held a moment of silence as both teams lined up outside their dugouts Tuesday night to mark the one-year anniversary of the tragedy. 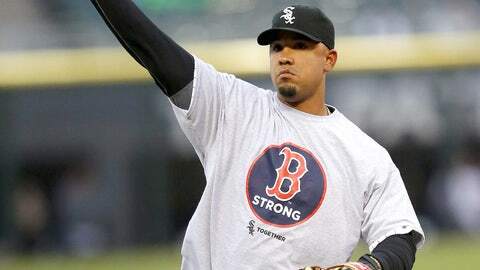 White Sox players and coaches wore T-shirts with the Boston Strong logo that the Red Sox often donned last year. White Sox players, from left, Paul Konerko, Chris Sale, Nate Jones, and Scott Downs stand wearing Boston Strong shirts before the matchup with the Red Sox on Tuesday.